Chest pain is often considered the hallmark symptom of a heart attack, but not everyone having a heart attack experiences the same pain. In particular, women, the elderly, or people with diabetes may experience no pain, or atypical symptoms. If you have any of the symptoms listed below in combination with chest discomfort, call for emergency medical services right away . Heart attacks can cause severe, permanent damage to the heart, or death. Quick medical treatment is important to increase the chance of survival and decrease the amount of damage to the heart. The sooner the blood flow is restored, the better the outcomes tend to be. Ideally, treatment should be within the first hour after symptoms begin. Do not drive yourself or someone else to the hospital. Emergency medical service personnel can increase the chance of survival and decrease injury by giving treatments while on the way to the hospital. Acute coronary syndromes. EBSCO DynaMed Plus website. Available at: http://www.dynamed.com/topics/dmp~AN~T116779/Acute-coronary-syndromes. Updated February 22, 2017. Accessed March 2, 2017. 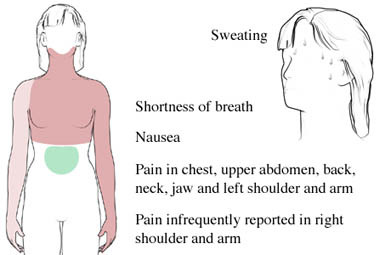 Heart attack symptoms in women. American Heart Association website. Available at: http://www.heart.org/HEARTORG/Conditions/HeartAttack/WarningSignsofaHeartAttack/Heart-Attack-Symptoms-in-Women%5FUCM%5F436448%5FArticle.jsp#.VxFCt02FMdU. Updated January 10, 2017. Accessed March 2, 2017. ST-elevation myocardial infarction (STEMI). EBSCO DynaMed Plus website. Available at: http://www.dynamed.com/topics/dmp~AN~T115392/ST-elevation-myocardial-infarction-STEMI. Updated January 30, 2017. Accessed March 2, 2017. Symptoms and diagnosis of heart attack. American Heart Association website. Available at: http://www.heart.org/HEARTORG/Conditions/HeartAttack/SymptomsDiagnosisofHeartAttack/Symptoms-and-Diagnosis-of-Heart-Attack%5FUCM%5F002041%5FArticle.jsp#.VxFCaU2FMdU. Updated September 16, 2016. Accessed March 2, 2017. Warning signs of a heart attack. American Heart Association website. Available at: http://www.heart.org/HEARTORG/Conditions/HeartAttack/WarningSignsofaHeartAttack/Warning-Signs-of-a-Heart-Attack%5FUCM%5F002039%5FArticle.jsp#.WLhEjPJuO0U. Updated September 29, 2016. Accessed March 2, 2017. What are the symptoms of a heart attack? National Heart, Lung, and Blood Institute website. Available at: http://www.nhlbi.nih.gov/health/health-topics/topics/heartattack/signs. Updated January 27, 2015. Accessed March 2, 2017.